Apple had stopped featuring disc drive on its products a few years ago. Including the MacBook Pro line, all laptops from Apple won’t sport a disc drive. The last MacBook Pro with a disc drive was the Mid 2012 non-Retina MacBook Pro. So if you want to copy DVD to MacBook Pro but use one other than the mid 2012 non-Retina model, then you are probably going to need an external disc drive. 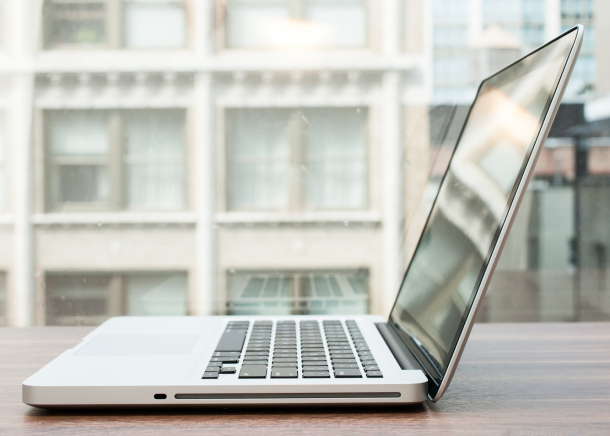 Apple has stopped updating its non-Retina MacBook Pro line after the mid 2012 model came out. It’s the last Mac the company sold that sports a built-in disc drive. Although the company didn’t release any update to the line, it was still available for sale on Apple’s official site for $1099 until 2016. And then Apple quietly killed it in October 2016. Now all Macs won’t feature an optical drive. Ever since Toshiba announced that it will stop producing HD DVD players, Apple had decide to stop featuring optical drives in its products as it will make its products unnecessarily thicker and heavier and requires more powerful hardware. Before you can copy DVD to MacBook Pro, you are going to need a disc drive. I would suggest that you go for a Blu-ray drive as it also supports reading DVD discs. Of course the cost would be higher, but if you also own some Blu-ray discs, a Blu-ray drive is definitely the better choice than a DVD drive. 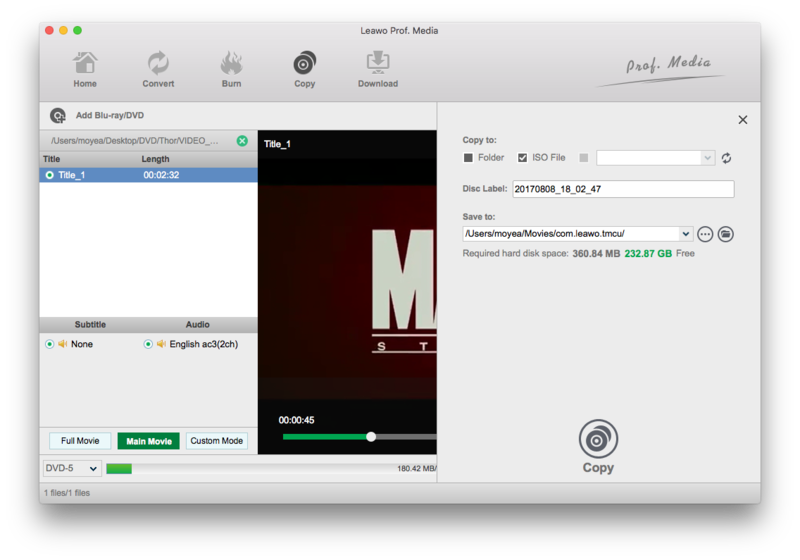 And about the software, I would be using Leawo DVD Copy for Mac. It’s a powerful and handy DVD copying tool that can copy protected and common DVDs. 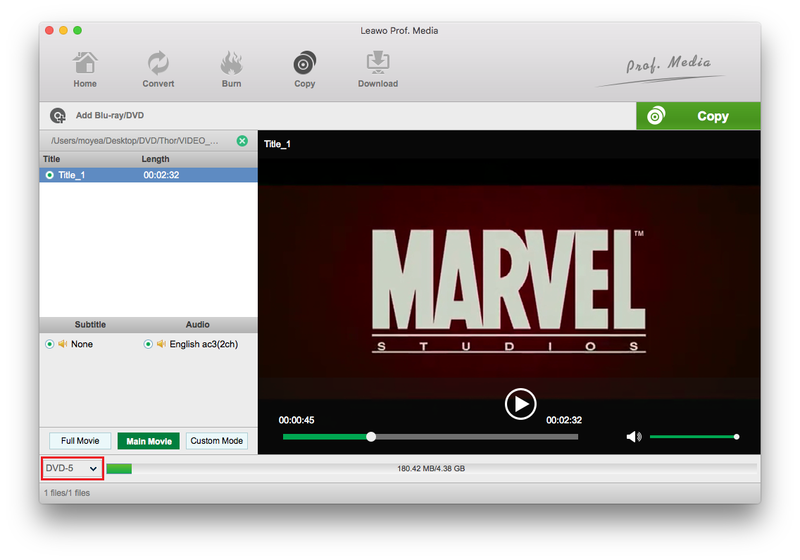 You can use it to easily copy DVD to MacBook Pro hard drive as a DVD folder or an ISO image. It’s also fairly easy to use as the interface is straightforward and simple. Below is how the program works. Step 1. 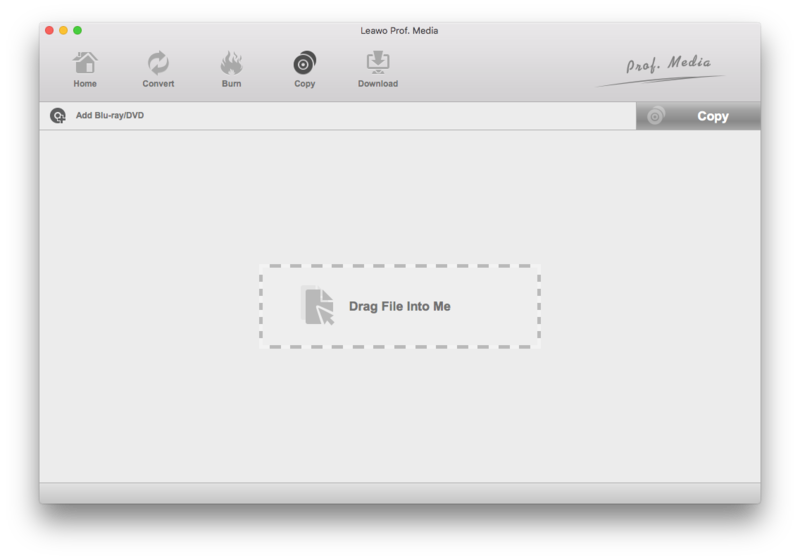 Leawo DVD Copy for Mac is included in a program called Leawo Prof.Media. So install the program, fire it up and find the DVD Copy tab on it. A simple click on the tab and you will be inside the interface of Leawo DVD Copy. Step 2. You can find one button above the blank area, the Add Blu-ray/DVD button. Go to Add Blu-ray/DVD>Add from CD-ROM>[your disc drive] to load the content like titles, subtitles and audio tracks in the disc to the program. Step 3. On the following panel, all the titles, subtitles and audio tracks will be listed. You can play the titles on the preview windows on the right-hand side. And there are in total of 3 different copy modes provided. To copy all content in the disc to your MacBook Pro, click on Full Movie. 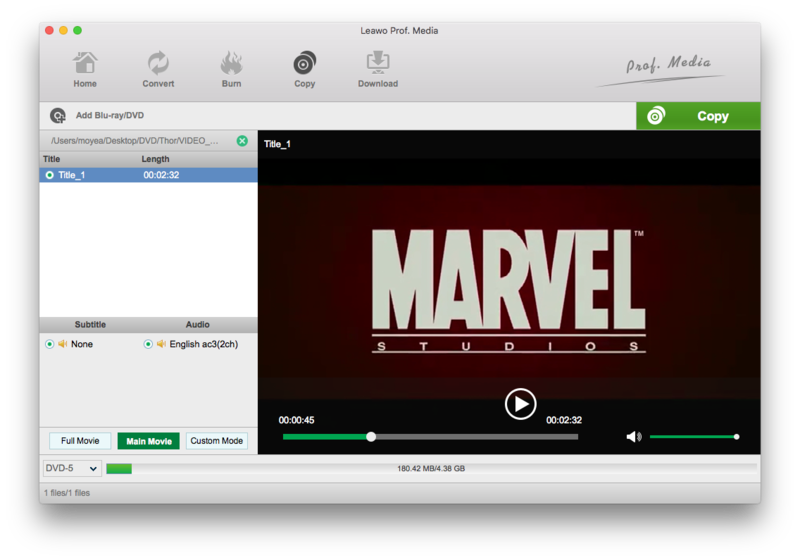 Click Main Movie to have the main movie selected for backup. If you choose Custom Mode, you can choose which titles to back up on the title list. Step 4. Choose a DVD format for the backup. It can perform DVD-9 to DVD-9, DVD-9 to DVD-5 and DVD-5 to DVD-5 copies. Step 5. Proceed to the final step by clicking the Copy button above the video preview window. The sidebar that follows contains some key settings. If you recall me saying that it can back up the DVD disc to your hard drive as a DVD folder and an ISO file, you should understand what the Folder and ISO File options are for. Check the box in front of the option that you want to go for and select a folder on your hard drive to store the backup in the output path box under the Save to label. You can also rename the backup in the Disc Label box. Click Copy to start copying DVD to MacBook Pro. If your Mac doesn’t have a DVD drive and you have a bunch of DVDs to back up, then you should probably get an external drive for your Mac. And I would suggest that you opt for a Blu-ray drive instead of a DVD drive and save yourself from the trouble of getting another disc drive when you want to back up your Blu-ray collection. There are some excellent Blu-ray drives that work great for Mac. With a Blu-ray drive, you can not only back up your DVD discs, you can also copy or even rip your Blu-ray collection to MP4 or other video formats for convenient playback on your Mac or your mobile devices.